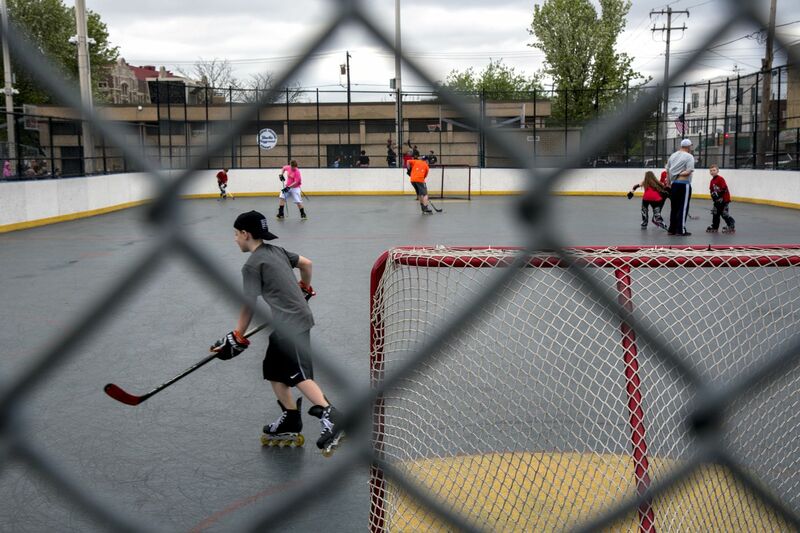 Youngsters play on the hockey rink at the Burke Playground. Since 2014, Philadelphia City Councilman Mark Squilla has directed $23,000 in public money to the Burke Community Fund, a nonprofit named for the playground. Since 2014, Philadelphia City Councilman Mark Squilla has directed $23,000 in public money to the Burke Community Fund, a nonprofit named for a South Philadelphia playground. Squilla founded the group two decades ago, long before he joined Council. It’s registered to his home address but no longer run by him. How exactly the fund spends the money is unclear, beyond general descriptions such as “basketball fees” and “Family Day & Christmas event” at the playground on Second and Jackson Streets. The city doesn’t have such records, nor does Squilla’s office. The Burke Community Fund grant is one of hundreds doled out each year through the Philadelphia Activities Fund, a nonprofit that gets more than $2 million annually from the Department of Parks and Recreation. It was established 25 years ago as an independent overseer for community funding requests, with the hope of ending the ethically fraught practice of letting Council members choose which groups in their districts deserve money. In the years since, the fund has distributed tens of millions of dollars. But an Inquirer review suggests that there’s been little, if any, oversight. The fund has never been audited and hasn’t filed a tax return since at least 2007. In 2010, the IRS revoked its charity status for failure to file the returns. The board that was supposed to monitor the money went years without meeting. Individual Council members remain the deciders of who gets the money. Each of the 10 representing a geographic district gets about $220,000 a year and effectively tells Parks and Rec where to send the checks. And they are giving money to more than just not-for-profit groups, the Inquirer review shows. A few have given money to for-profit boxing gyms. One spent $32,000 to hire entertainment for summer outings in her district. Another gave thousands to a job-training business. After The Inquirer informed the fund that its tax-exempt status had been revoked, the fund’s new chairman, Councilman Brian O’Neill, pledged to hire a lawyer to help it restore its tax-exempt status. He also has been advocating for an audit of the fund. “Had the board been doing audits, the situation we find ourselves in where no tax returns have been filed would never have happened because we couldn’t have gotten a clean audit,” said O’Neill, a longtime member of the board. Here are organizations that received money in the 2017-18 fiscal year from the Philadelphia Activities Fund, a nonprofit controlled by the 10 district Council members that has given out tens of millions in taxpayer grants since its creation. Council members have given checks ranging from $200 to $7,500 to numerous nonprofit groups and churches, but also to for-profit enterprises and individuals. Roll over or tap on the boxes on the graphic below for information on recipients and amounts received. The flaws in the Activities Fund come as state prosecutors prepare for a trial against the onetime chairwoman of another nonprofit fund run by the city. In that case, Desiree Peterkin Bell is accused of stealing money from the Mayor’s Fund and using it on personal travel and expenses. O’Neill and other city officials defend city-run nonprofits as a way for the city to subsidize community-based organizations more quickly than the city’s bureaucratic, grant-approving process. But by their very nature, nonprofit funds avoid the city’s fiscal controls. Beth Gazley, a professor and nonprofit expert at the Paul H. O’Neill School of Public and Environmental Affairs at Indiana University, said that extending the reach of government through a nonprofit can bypass collective-bargaining obstacles and make contracting easier. But it also removes the transparency of sunshine laws and public meetings. City Controller Rebecca Rhynhart, who serves as an elected watchdog over city finances, said the fund’s lack of oversight and loss of its IRS status seemed “problematic.” She said she plans her own review. “I’ve had my own questions around the necessity of the use of nonprofits by city government. … I would like to hear a good defense of why we need it,” she said. In the 1980s, Philadelphia community groups, theaters, and other arts programs were subsidized through the city’s “Class 500” fund, run through the City Council president’s office. At its peak, the fund had $14 million to distribute, often to groups with ties to Council members. The fund was shut down after the Daily News reported in 1987 that then-Council President Joseph E. Coleman funneled Class 500 money to two nonexistent youth organizations. In the early 1990s, Mayor Ed Rendell created similar funds in a bid to placate Council members as he sought their support on controversial issues. The Cultural Fund was designed to subsidize arts and culture programs in the city; the Activities Fund, for recreational activities. Both were to be separate nonprofits with oversight boards. “We want to make sure there is no abuse, that it goes directly to support kids,” Rendell said at the time. The Activities Fund grants were to be administered by the Parks and Recreation Department. But the fund’s bylaws state that the board of directors has “full power” to manage the organization and make funding decisions with the “recommendations” of Council members. Almost from the beginning, though, the 10 district Council members had full discretion. A department staffer fields the applications and forwards them to the relevant district Council office. The fund has since grown to have a $2.5 million budget — a direct deposit from Parks and Rec’s own $67 million budget. The fund’s board of directors now includes three Council members — O’Neill, Cindy Bass, and Jannie L. Blackwell — plus a Council staffer and three others with ties to the Parks and Rec Department, including its commissioner, Kathryn Ott Lovell. Lovell said the vetting of grants falls to the individual district Council offices, and Parks and Rec merely cuts the checks — up to $7,500 each. The four-page grant form asks applicants to describe their organization, its nonprofit status, the zip codes it serves, the “educational, developmental, or motivational benefits” it provides, where and over what time span. It also includes sections to list organization officials and other fund-raising. After getting their money, grant recipients are supposed to file a report describing their spending. Lovell said the board gets such detailed reports from only about 20 percent of grant recipients. “I see that as the role of Council,” she said last week. Councilwoman Maria Quiñones-Sánchez said her office verifies grant spending in her district by asking recipients for event fliers or other forms of proof. Squilla and others said it’s up to the Activities Fund board to track the expenses. Mayor Kenny, dressed as Buddy the Elf, and Councilman Mark Squilla as Santa, give out toys to the children at the annual Burke Playground Christmas party Dec. 19, 2017. The response lines for both were left blank. Other recipients of Activities Fund grants include many park and libraries “friends of” groups that have also lost their federal tax-exempt charity status, according to an Inquirer review of the 2017 and 2018 awards. Some were for-profit businesses and individuals who, according to the fund bylaws, should not have been eligible for the grants. Some money went to pay for block parties. Councilwoman Cindy Bass paid $32,300 for entertainment, including a DJ and a clown troupe, at her “summer events series” in her district, which includes Nicetown, Germantown, and West Oak Lane. There are also such groups as Bomberos de la Calle, a Puerto Rican musical group that Quiñones-Sánchez approved for a $5,000 grant last year. It isn’t registered as an organization with the state. Quiñones-Sánchez defended the subsidy, saying such groups are essential to the city’s diverse neighborhoods. “No one in the city is giving an opportunity for Bomberos de la Calle. They play all over the state representing Philadelphia and teaching kids about arts and culture,” she said. Then there are political connections. In a January story about the fund, the website Billy Penn reported that Blackwell gave $14,000 in Activities Fund grants in 2016 and 2017 to Southwest District Services, which has held fund-raisers for the councilwoman and whose chair at one point was Blackwell aide Saboor Muhammad. Blackwell, a member of the Activities Fund board, did not respond to a request from The Inquirer seeking comment. O’Neill, Squilla and Quiñones-Sánchez defended the grants, saying the city could never afford to fully fund the recreation programs that get the small grants. They saw no problem giving taxpayer money to for-profit groups.